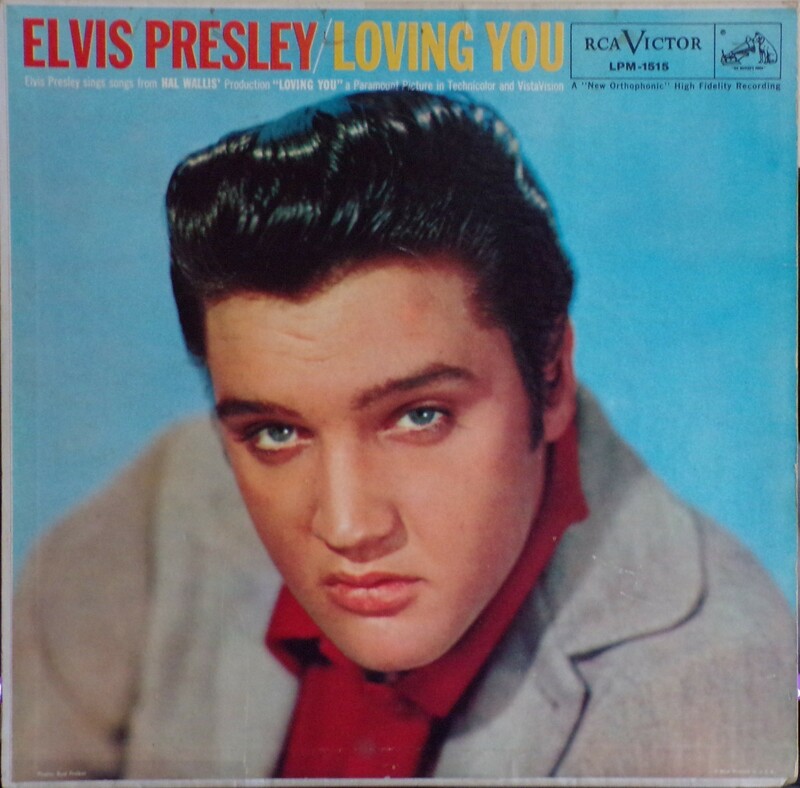 Brief History : Loving You is the third album by Elvis Presley, issued on RCA Victor Records in mono, LPM 1515, in July 1957 - the July 1 release date is unconfirmed. Recording sessions took place on January 15, 16, 17, and 18, 1957, at the Paramount Pictures Scoring Stage, and on January 12, 13, 19, and February 23 and 24, 1957, at Radio Recorders in Hollywood. These are the first sessions where Steve Sholes is officially listed as producer. It spent ten weeks at #1 on the Billboard Top Pop Albums chart. It was certified Gold on 4/9/1968 by the R.I.A.A. 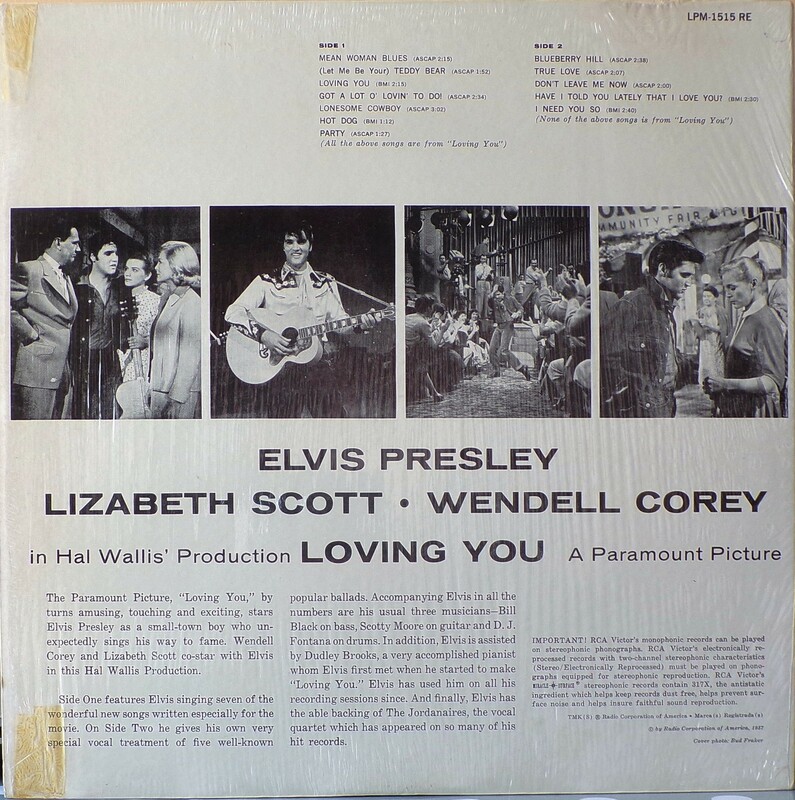 The soundtrack includes seven songs composed expressly for the movie from writers contracted to the publishing companies owned by Elvis and the Colonel, Elvis Presley Music and Gladys Music. An eighth song intended for but not appearing in the movie, "Don't Leave Me Now", was included on the album, and a new recording would appear on the soundtrack for his next film, Jailhouse Rock. 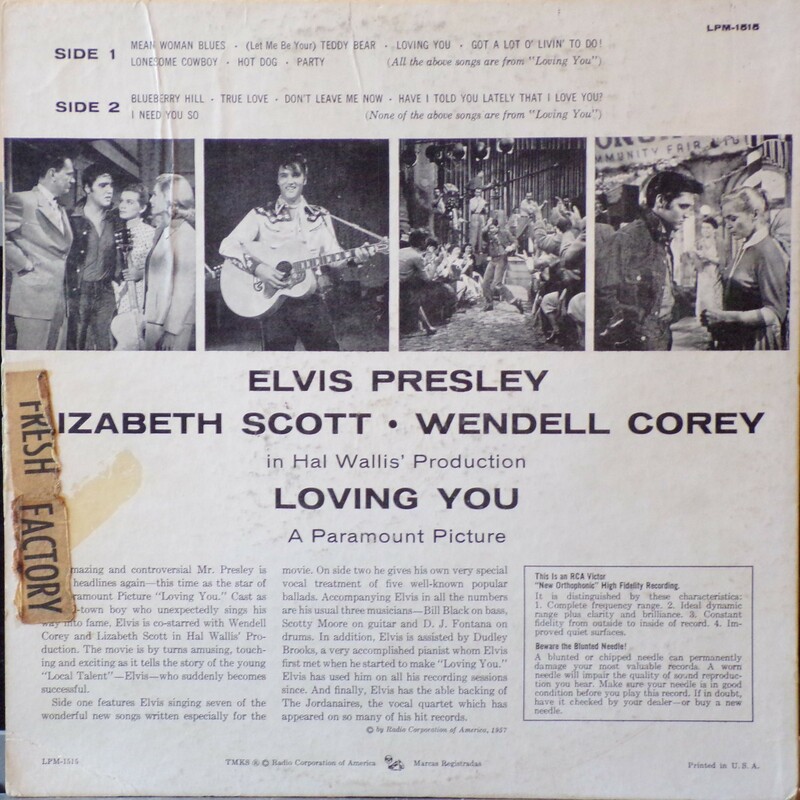 The previously released material comprises both sides the single taken from the soundtrack, Presley's #1 hit "(Let Me Be Your) Teddy Bear" backed with the film's title track, "Loving You". Producer Hal Wallis liked "Teddy Bear" so much that he insisted it be included in the movie. Songs were added to bring up the running time of the album, including the swing-era favorite "Blueberry Hill", covered by many had been recently a big hit for Fats Domino in 1956. "Have I Told You Lately That I Love You" had been done previously by the Sons of the Pioneers as well as Bing Crosby with The Andrews Sisters. 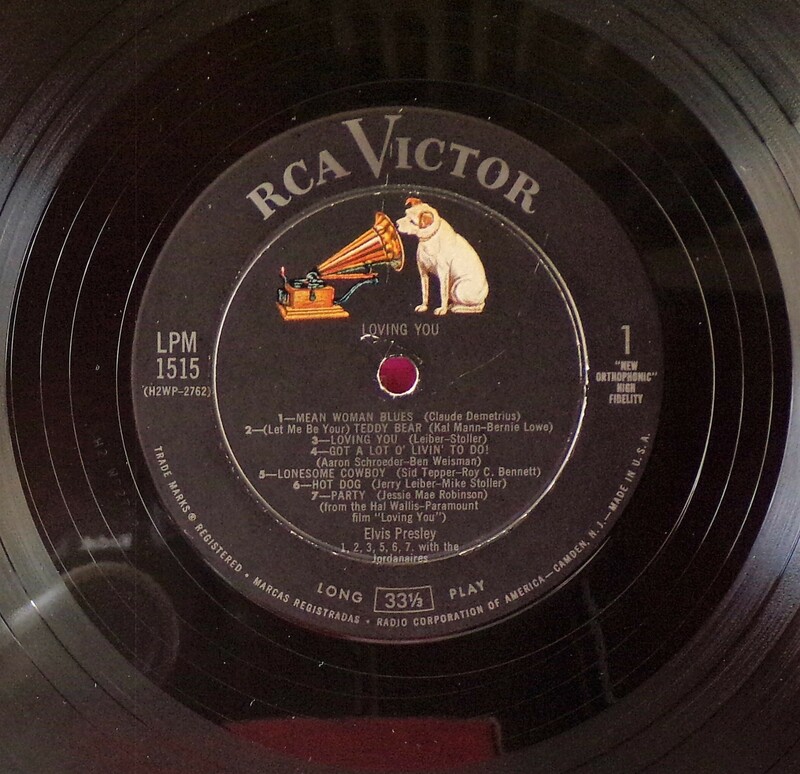 Cole Porter's last great standard, "True Love", written for the 1956 musical film High Society also made the album, either to feature a straightforward romantic song, or to give Presley and The Jordanaires an excuse for some close harmony singing. 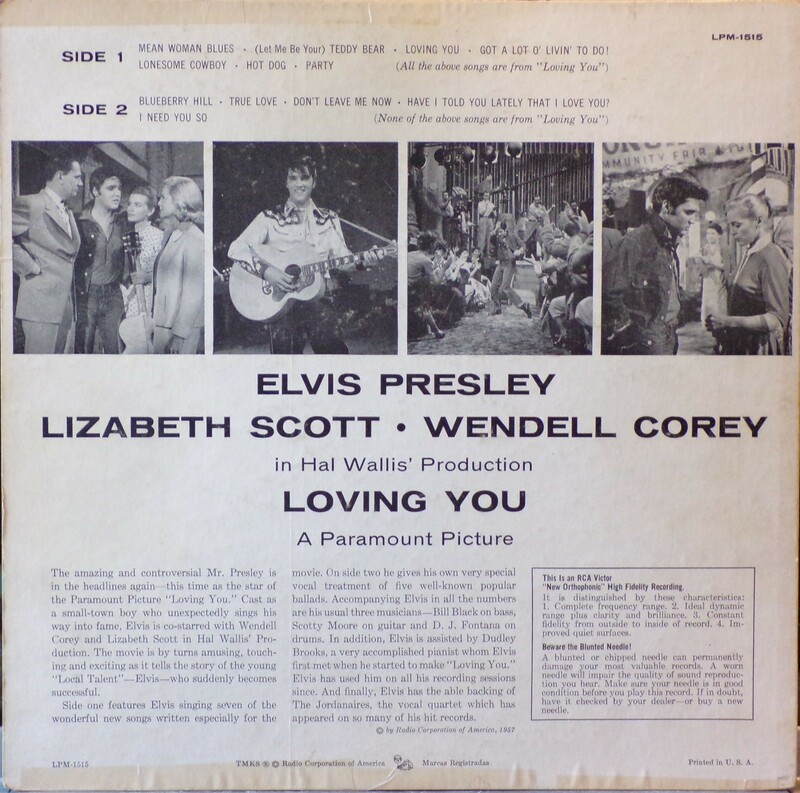 The practice of RCA augmenting soundtrack recordings with extra songs from non-soundtrack studio sessions to bring up the running time of the LP to acceptable lengths would become a commonplace occurrence with Presley soundtracks through the 1960s. Front Cover : Elvis photo. Bottom left "Photo : Bud Fracker". Bottom right "Printed in U.S.A.". Catalogue number top right. Logo top right. ​Rear Cover : 4 black & white photos of Elvis. Catalogue number top right & bottom left. 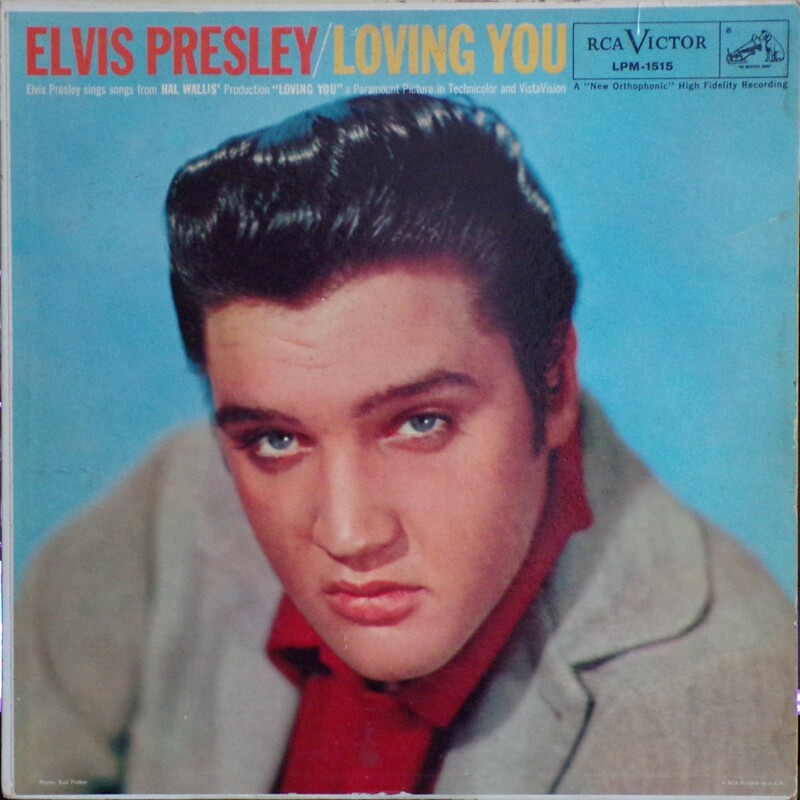 Bottom right has Printed in U.S.A.
Side 1 : Left side has title "Loving You". "New Orthophonic" High Fidelity centered under dog. Long Play at bottom. 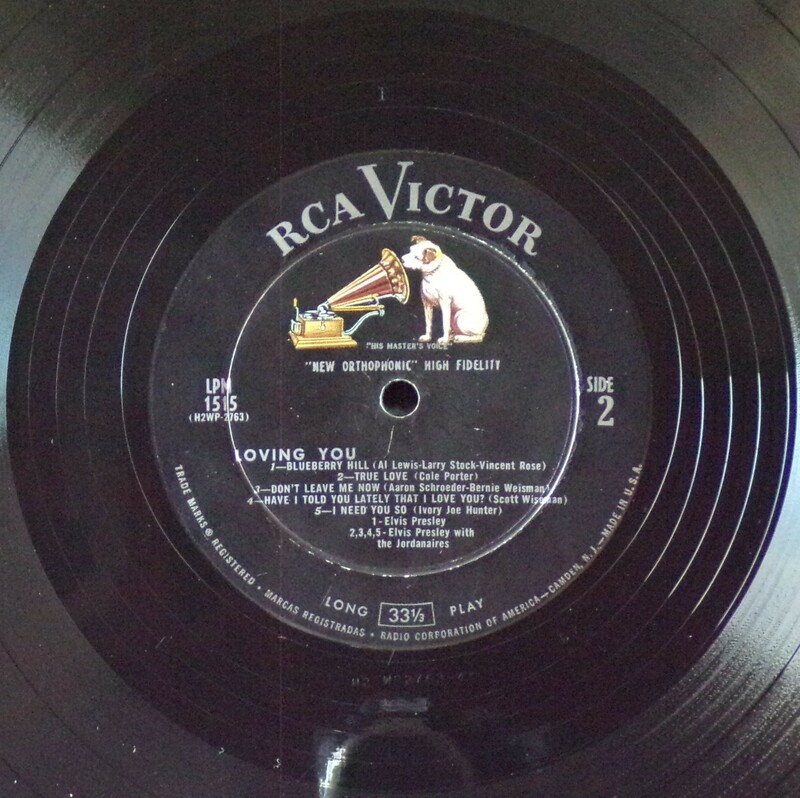 Side 2 : ​Left side has title "Loving You". "New Orthophonic" High Fidelity centered under dog. Long Play at bottom. 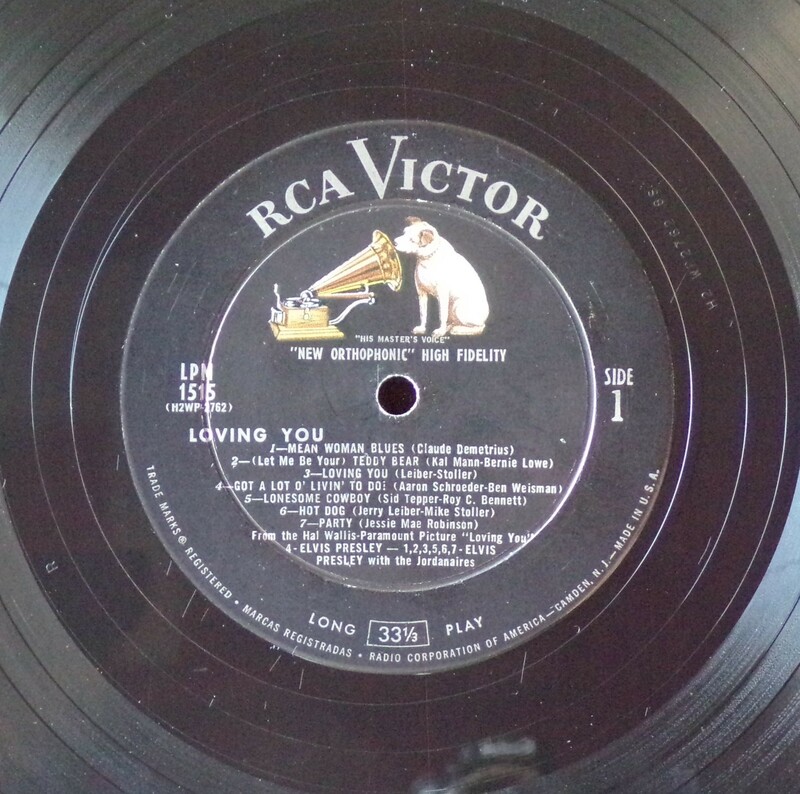 Side 1 : Loving You centered under dog. "New Orthophonic" High Fidelity under the number 1. Long Play at bottom. 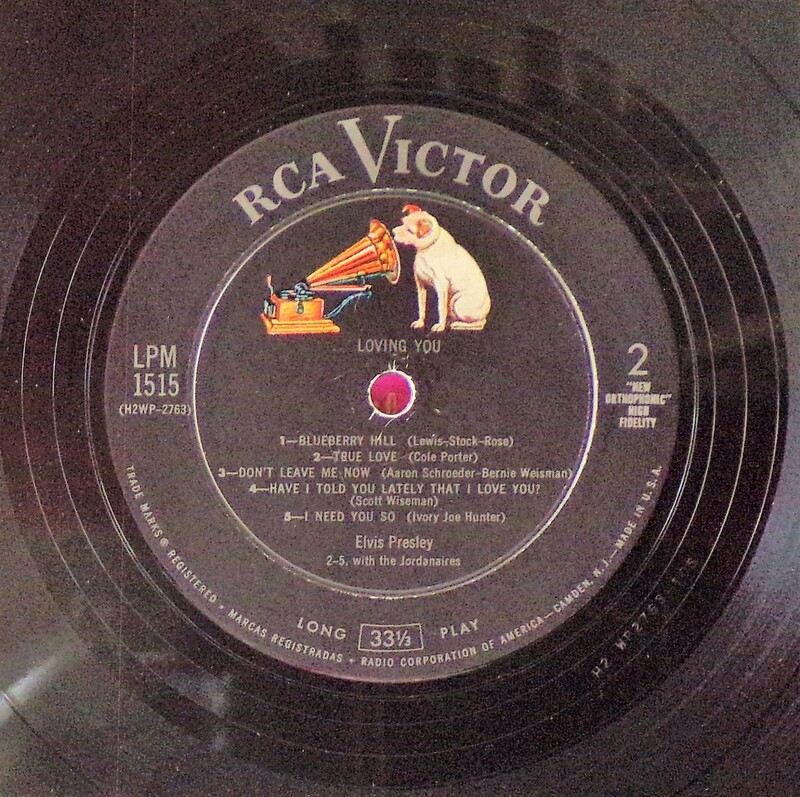 Side 2 : ​Loving You centered under dog. "New Orthophonic" High Fidelity under the number 2. Long Play at bottom. 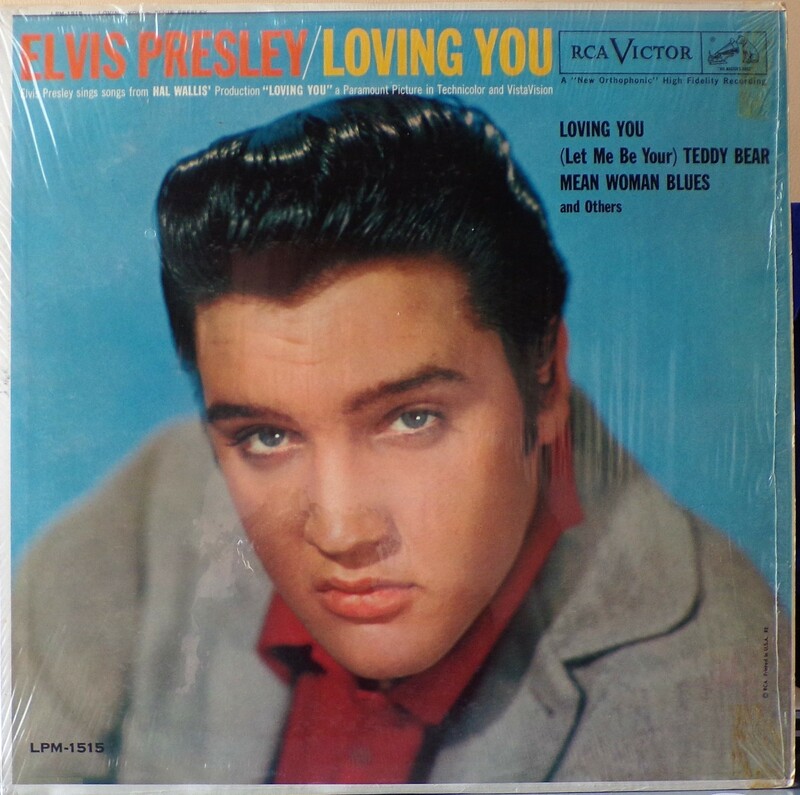 *NOTE* Side 1 vinyl has the number 4 to the left of the name Elvis Presley. 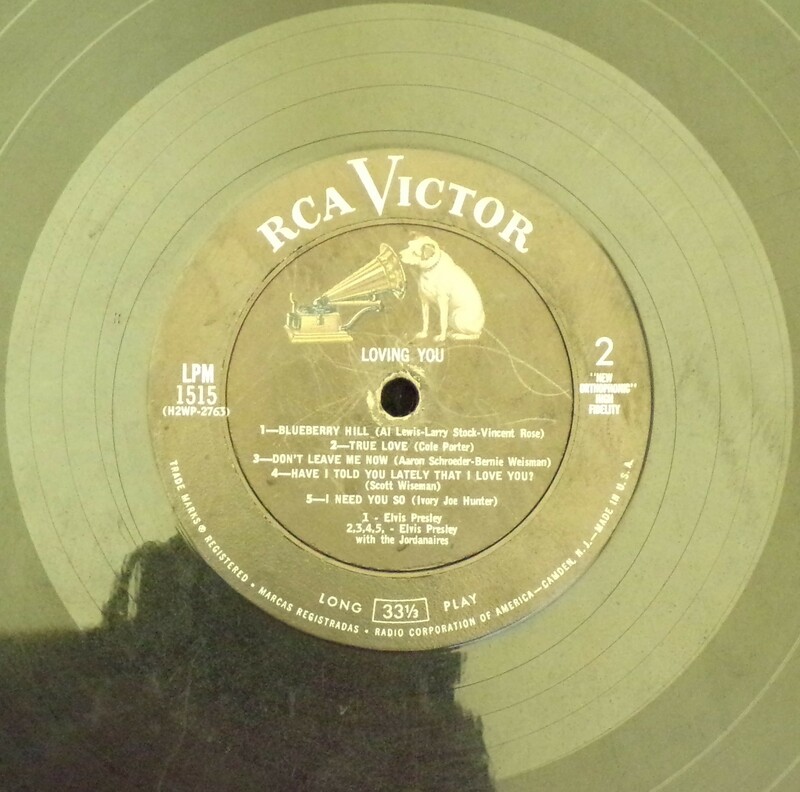 Side 1 & 2 vinyl Elvis Presley with the Jordanaires. Side 2 vinyl song 1 has the song writers full names. Details : November 1963 cover release in shrink with "Long Play" at bottom of label inside not "MONO". Also song titles on front cover. Front Cover : Elvis photo. No Bottom left "Photo : Bud Fracker". Bottom side right "Printed in U.S.A. RE". Catalogue number bottom left. Logo top right. ​Rear Cover : 4 black & white photos of Elvis. Catalogue number top right with "RE". Bottom right has cover photo Bud Fraker. 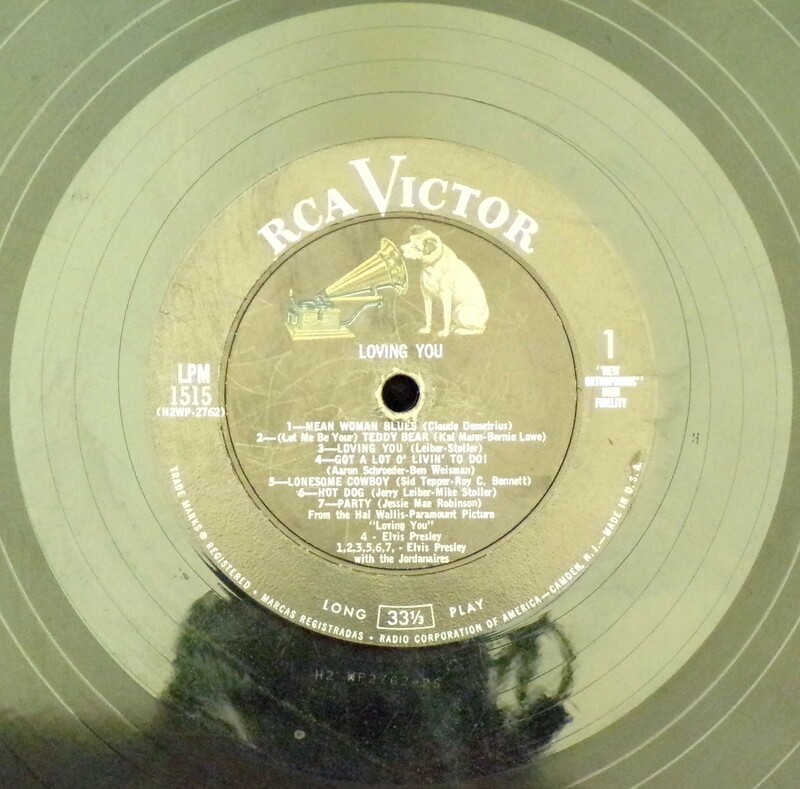 *NOTE* Side 1 vinyl does not have the number 4 to the left of the name Elvis Presley. Sides 1 & 2 vinyl's has with the Jordanaires. Side 2 vinyl song 1 only has surnames.